Because this portion of the semester is two weeks long, instead of one, we’ve been given six Daily Create tasks to do, instead of the usual four. Today’s task had us draw our “host character,” which is defined by the site as either “a favorite character from one of your digital stories, or one you love.” Since I’ve already brought up the franchise thrice before, first as inspiration for a “Hobo Speech” I did for fun, then as the basis for a BuzzFeed personality quiz that was actually turned in for a grade, and most recently as the result of a Daily Create assignment of my own creation, it was only fitting that I went for the “grand slam” here. This sketch, which I worked on for hours before taking the photo on my iPhone, is of the face of Kaito Kuroba, from Magic Kaito 1412. I designed it in the same vein as street graffiti, using various bits of inspiration to pull off the desired effect. 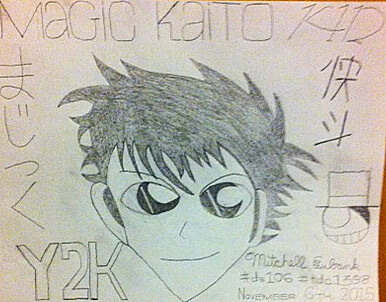 Yes, I named the picture “Y2K” as a nod to Kaito’s name, as well as hinting at Kaito’s alter-ego, the Kaitou Kid, being “The Last Wizard of the Century,” according to the third Detective Conan movie of the same name, released in Japanese theaters in 1999. The kanji for the manga’s title are shown on the sides, with the right side including my version of the Kid’s insignia. At the top, you can see the name of the anime he stars in, written in the fonts of the Americanized manga logo, and the cursive “1412” part of the anime logo. After a minor round of touch-ups using Photoshop, I turned everything into Flickr and Twitter, closing up shop for now.